In the late summer of 1274, King Edward has finally been anointed England's ruler. His queen contemplates a pilgrimage in gratitude for their safe return from Outremer, a journey that will include a stay at Tyndal Priory. "What makes this series—this is the seventh entry—tick are the recurring subplots involving Eleanor, Thomas, and Ralf that run through all the narratives, binding the characters and their intimate stories together into an intriguing subtext." "Royal gets better with each book. Her seventh series title (after Chambers of Death) has Prioress Eleanor honing her skills and her knowledge of political maneuvering. 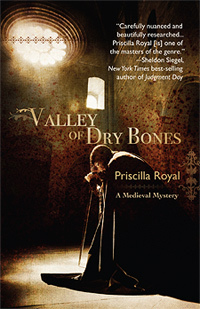 This is a series not to be missed by readers who yearn for one more medieval mystery from Ellis Peters."